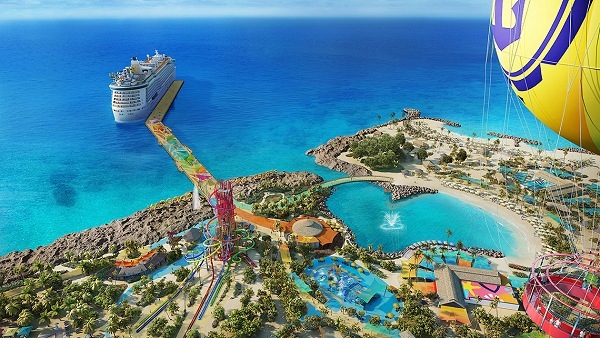 Royal Caribbean Cruises Ltd. (RCCL) will develop private islands around the world that will be marketed in a new “Perfect Day Island Collection.” The program will start with the upcoming relaunch of Bahamian private island CocoCay in September. Few other details of the initiative were released, other than RCCL expects to include islands in Asia, Australia and the Caribbean. The program was unveiled at an event at New York’s South Street Seaport last week. RCCL also announced a $900 million, 10-ship refurbishment program and for the first time, unveiled details of the improvements it has planned for CocoCay. RCCL said it spent $200 million to renew the island, which it acquired in 1988. Guests will find a pair of water towers with 13 slides, including the 135-foot Daredevil’s Peak, which RCCL says will be the tallest in North America. 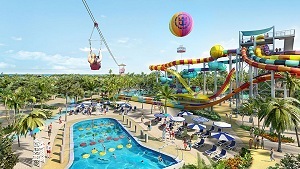 The Thrill water park will also include the Caribbean’s largest wave pool and a “kid-friendly obstacle course pool.” The Oasis Lagoon, billed as “the Caribbean’s largest freshwater pool,” will feature a swim-up bar, in-pool loungers and a 1,600-foot zipline with a water landing. Another new attraction: Up, Up and Away, a helium balloon that will soar up to 450 feet to provide a bird’s-eye view of the blue Bahamian waters. The beach areas are being redone. RCCL said Chill Island will be “the ultimate beach escape” with cabanas, daybeds and lots of activities such as volleyball, glass-bottom kayaking and zorbing in an inflatable zorb ball. 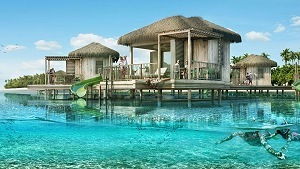 A more upscale venue, Coco Beach Club, will offer what RCCL says are the first overwater cabanas in the Bahamas. The current timetable calls for some of the features to open in September with the majority open by spring of 2019 and Coco Beach Club by November 2019. The schedule means that the new pier at CocoCay won’t be ready when the 3,114-passenger Mariner of the Seas begins its short-cruise assignment from Miami in late June. RCCL is spending $90 million to make over the Mariner as a showpiece short-cruise ship. RCCL initially expected the pier to be ready in June. Guests now use tenders to get to the island, but Mariner of the Seas carries 30% to 50% more passengers than the ships that currently use CocoCay. In 2019, Navigator of the Seas will become the second Voyager-class ship to be moved to three- and four-day cruises and receive “an even more extensive modernization” than the Mariner. RCCL said it has budgeted $900 million for a refurbishment program that covers 10 ships over the next four years. The program, dubbed “Royal Amplified,” is a follow-on to the 2011-2016 “Royal Advantage” refurbishment of most Royal Caribbean ships. New features on the Mariner will be mainstays of the Royal Amplified upgrade package. They include Sky Pad, a virtual reality bungee trampoline; Battle for Planet Z, a glow-in-the-dark laser tag game; The Bamboo Room, a retro lounge with tiki‐chic decor; and the Playmakers Sports Bar & Arcade. Other parts of the package include the New England-style Hooked Seafood and El Loco Fresh, a Mexican restaurant. In addition to the two Voyager-class ships, Royal Caribbean specified Independence of the Seas and Oasis of the Seas as among the first ships to get the Royal Amplified treatment.